a conversation about great museums a few nights ago reminded me of the brandhorst, which i visited in 2009.
after a brief interlude for a stunning andechser doppelbock (dark and clear, with a crisp, malty flavour, plenty of acidity, and the aroma of citrus--thank you patrick), we headed back to the maxvorstadt* to see the new brandhorst museum, designed by sauerbruch hutton. 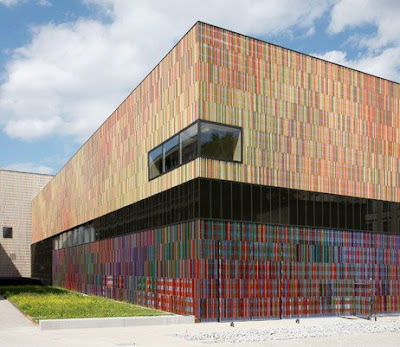 the outside is clad with a bi-coloured steel skin covered with a layer of vertically-affixed ceramic rods glazed in a variety of different colours. the intent was to both shield the building from sun heat and to reduce reverberations from street noise; these objectives achieved, the skin of rods also gives the building an appearance of shifting colouration such that, from afar, it looks more like a collection of rectilinear masses of pure colour than a building. the collection is from udo and anette brandhorst, yet another pair of tremendously-wealthy art collectors. the brandhorst collection focuses on contemporary artists from europe and north america; they have a stunning number of cy twomblys, and have in fact built the cavernous and beautiful upper galleries expressly to display their collection of twombly's giant rose paintings, a large proportion of the lepanto cycle, and many of his sculptures. i blame my poor education and exposure for my inability to see the slightest sense of wonder, insight, technical development, or rich meaning in these works. fortunately, the profound vacuity of the upper gallery was redeemed by the museum's superb construction (the inside was all limed oak, high ceilings, plastered walls, and frosted glass) and two paintings crammed into the ground floor gallery. the first, by sigmar polke, is painted on glazed synthetic cloth such that the canvas becomes translucent and reveals the framework of the stretcher behind it; additionally, there is a section of canvas that has been printed with colours handprints and stitched in. 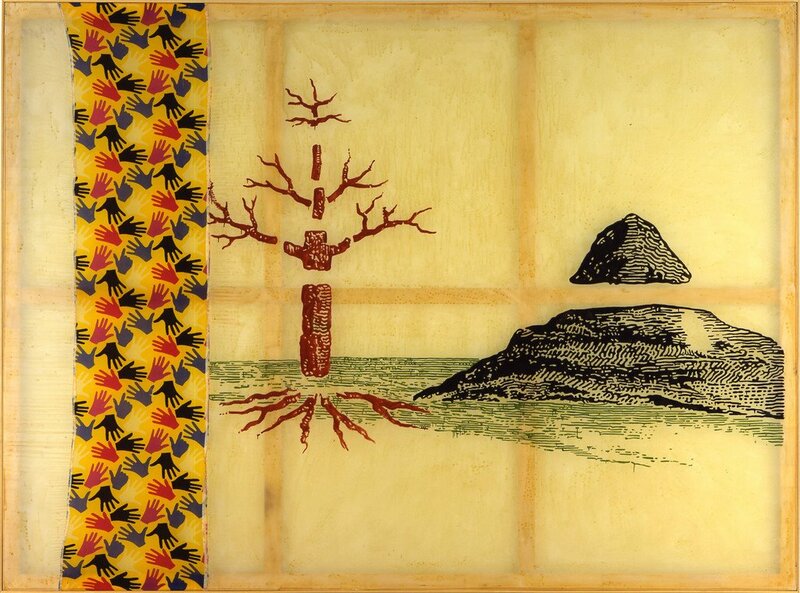 the imagery is of a tree bare of foliage and a mountain in segments, both with perspective slightly messed up and represented as blown-up gravure lines painted on with clearly drippy paint--from a great distance, the tree and the mountain appear to have the tone and shade of paint but close-up they are clearly both line art and painting. the title is the three lies of painting which gives rise to a host of possible interpretations given the transparency and intentional fragmentation of the canvas ground and the numerous conscious and explicit pieces of trickery in the painting. 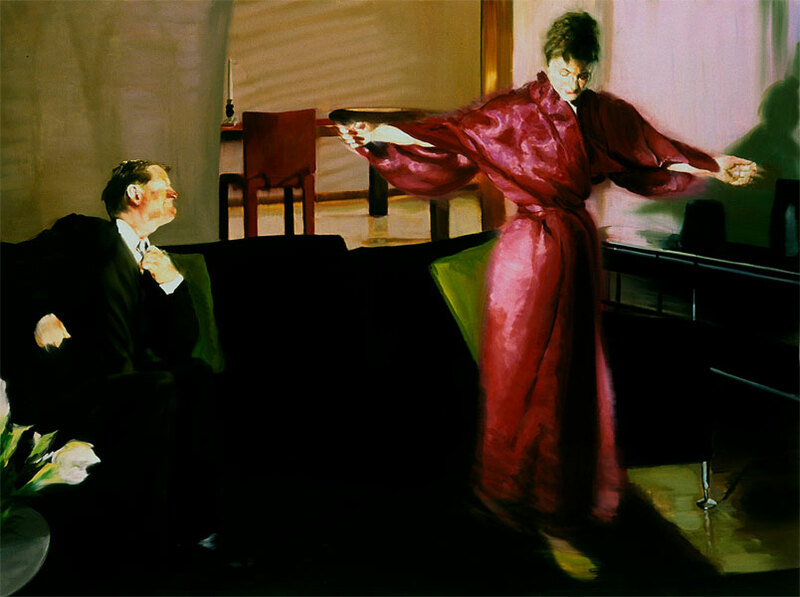 the second, by eric fischl, reminds me a little of sargent's el jaleo in the isabella stewart gardner museum. living room #3 (spinning) is part of his krefeld series in which he hired two actors to live in restored mies van der rohe houses and painted a series showing snapshots of their lives. this one is one of the best. 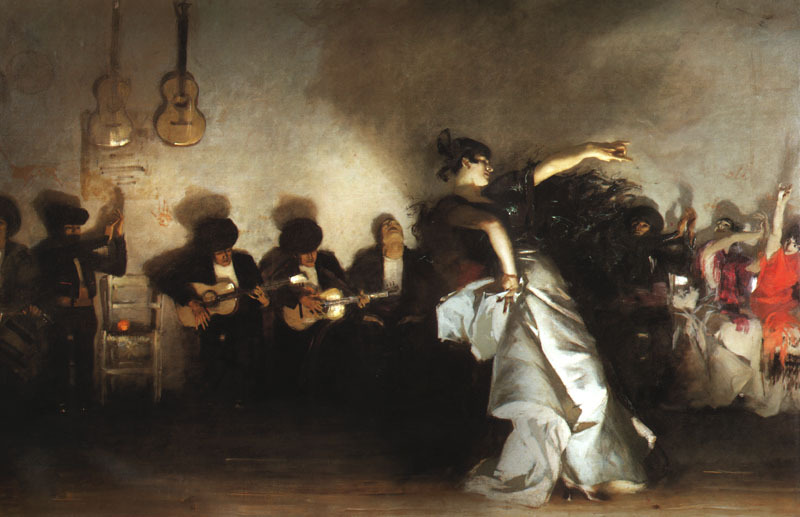 the titanium white in the faces creates an irresistible sense of powerful light off to the left, and the sense of movement in the gown suggests an expanse of time, a prior history of interaction, and a durable mood all condensed into an unmeditated and transient moment. this has some connection to the tea ceremony concept of 一期一会. margaret was saying [and here, you can read what margaret actually said, which is actually about a completely different thing that i do agree with] that the unique value of paintings is in their ability to do what photographs cannot do, in the same way that the unique value of the novel lies in its ability to do what films cannot do. i think this may be a specifically correct judgment given a particularly good painting and a mediocre photograph, but i can think of many good photographs that are better than mediocre paintings and good films that are better than mediocre books. perhaps a more precise and generalizable rubric is that representations of objects and events are valuable in so far as they capture and can communicate a sort of density of meaning, and they are more valuable the more intense, the more dense they are. these two pieces by polke and fischl (and the flavin and sandback pieces in the pinakothek, and the installations of fragmentary statuary in the glyptothek) are dense with what irene winter calls affective power, the way the numerous pieces by twombly are not. * margaret also notes that: "In the interests of strict accuracy, the Brandhorst is not at Königsplatz. It's in Maxvorstadt. Königsplatz is a square, not a district. The Glyptothek, meanwhile, is definitely at Königsplatz." 'tis.